The Pirate fault forms the western boundary of the Santa Catalina Mountains near Tucson and separates the mountains from the Cañada del Oro basin to the west. The fault occurs just east of the communities of Saddlebrooke, Catalina, and Oro Valley. Remnants of this fault, exposed for about 15 miles along the mountain front, are described in a paper from the Arizona Geological Survey (see reference below). The paper describes geological features of 10 sites along the fault trace. The AZGS says that this fault represents an expression of Basin & Range faulting which was active between 12 million and 6 million years ago. 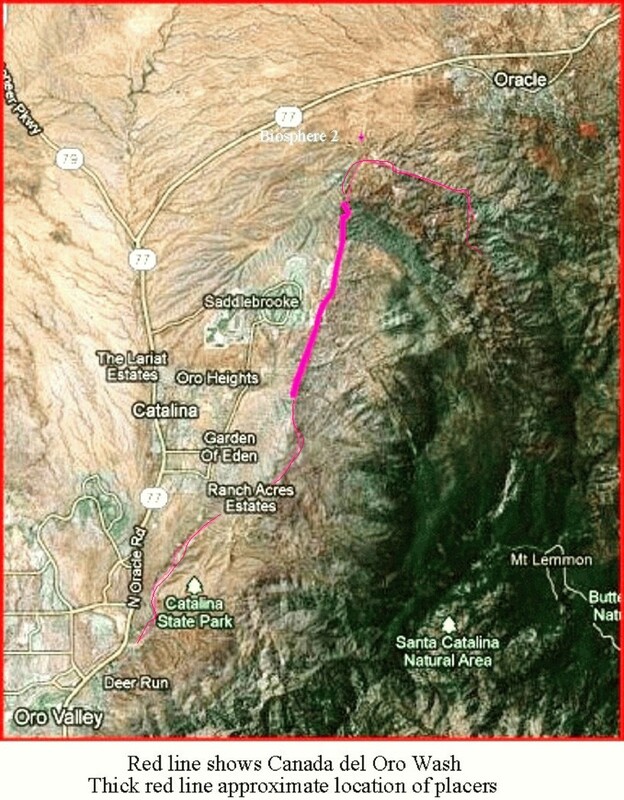 Vertical displacement on the fault is estimated to be about 2.5 miles with the west side down relative to the Santa Catalina Mountains uplift on the east. The fault dips from 50° to 55° west along its entire trace. The Basin & Range era was a time of crustal extension which formed much of the topography in Southern Arizona. “Deposition of basin-fill material in the Cañada del Oro basin culminated in Pleistocene time (1-2 Ma) following cessation of active uplift on the Pirate fault. Alluvium deposited during this latter time forms the high-stand surface of coalescent alluvial fans composed mostly of detritus eroded from the Santa Catalina Mountains.” That material contains placer gold deposits. The gold was derived from gold-bearing quartz veins in the Santa Catalina Mountains. The Pirate fault disappears beneath alluvium to both the south and north. If one projects the northern trace, the Pirate fault could intersect the southeast-to-northwest trending Mogul fault. 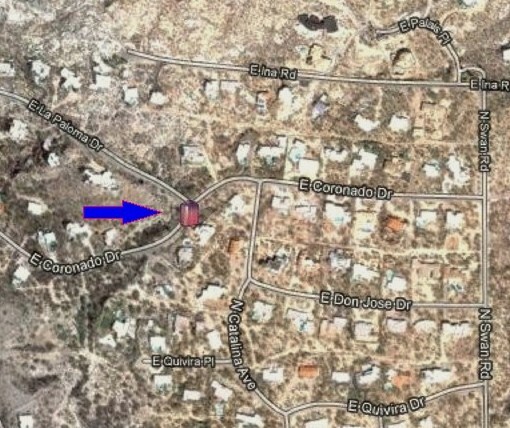 Indeed, near the projected intersection is a decorative stone quarry whose source rock is highly fractured, deformed, and altered bedrock that may be evidence of the projected fault intersection. Hoxie, D.T., Exhuming the Remains of the Inactive Mountain-Front Pirate Fault, Santa Catalina Mountains, Southeastern Arizona. 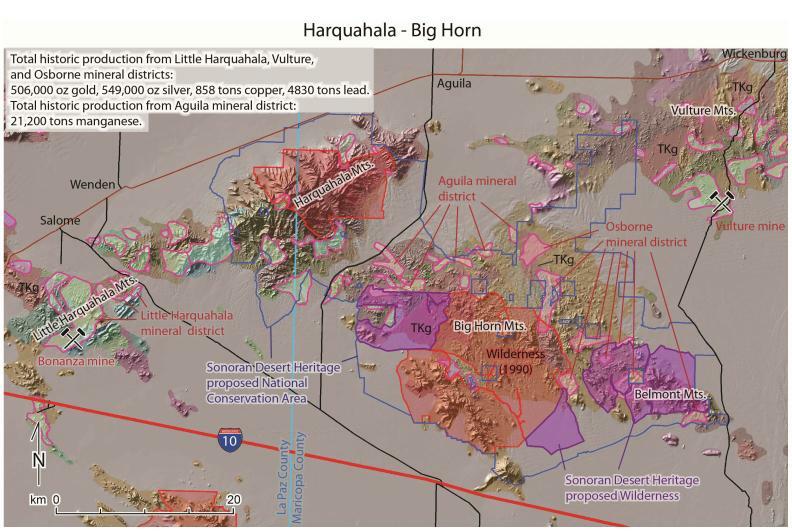 Arizona Geological Survey, Contributed Report CR-12-F, 18p. Posted in Geology and tagged basin & range, gold, Santa Catalina Mountains, Tucson geology on March 7, 2017 by wryheat2. The National Mining Association has produced an info-graphic (see below) on the current uses of gold in modern life (link). They also have a “tool kit” which shows how we all depend on minerals in our daily lives. Give it a look. Posted in Geology and tagged gold, manufacturing, uses on February 27, 2014 by wryheat2. Cyanide Beach is a purported documentary film about the Furtei gold mine in Southern Sardinia, Italy. The film was produced by John Dougherty of Investigative Media. The film is a smear piece which attempts to associate directors of the Canadian mining company, Augusta Resource, the parent of Rosemont Copper, with environmental concerns in the Furtei mine in Italy. The implication of the film is that Rosemont cannot be trusted to be good environmental stewards of the land and in doing so, the film is very loose with the truth. The film attempts guilt by association, but as we shall see, Rosemont/Augusta had no association with the Furtei mine at the time it was abandoned. I have not seen Cyanide Beach, just trailers from the film. I have read material from the website of Investigative Media and watched Rosemont’s video. The following is my understanding of what happened at Furtei based on information from both Rosemont and Investigative Media. The Furtei mine is a gold property in Sardinia developed and operated by an Australian company called Sardinia Gold Mining, which began mining in 1997. When the oxide ore ran out in 2002, the Australian company abandoned the property, leaving a small open pit which had produced about 138,000 ounces of gold. In 2003, a Canadian junior mining company, Sargold, joined with the Italian government to evaluate the remaining potential of the Furtei mine. Sargold, shared five directors with Augusta Resource. The evaluation consisted of drilling exploration holes and recovering some gold from a small amount of leftover oxide ore. Total production was about 1,300 ounces of gold and silver. The exploration results indicated that remaining gold would require underground mining, expensive processing, and a large initial capital investment, something Sargold was not willing to do. Other investors were interested, however. Sargold was merged into a company called Buffalo Gold in 2007. At the time of the merger, the five Augusta directors left Sargold and Buffalo Gold thereby relinquishing any control of or responsibility for subsequent operations at Furtei. Due to the worldwide financial breakdown beginning in 2008, Buffalo Gold went bankrupt, leaving the property unreclaimed. That is my understanding of events at Furtei. The film Cyanide Beach was produced in 2012 when it seemed that Rosemont was well on its way to obtaining permits necessary to open a copper mine south of Tucson. Opponents of the mine were getting desperate. According to Rosemont, the film was commissioned by Farmers Investment Company (FICO) which grows pecans in the Santa Cruz Valley near the town of Green Valley. FICO is also attempting to build a housing development on its land. Both pecan growing and housing need water. Apparently FICO is opposed to the Rosemont mine because the mine will compete with it for water resources. Cyanide Beach is nothing but a smear job, an attempt at guilt by association. The very name of the film is provocative. Cyanide is a standard, widely used, chemical employed for recovery of gold. There is no link between the five Augusta directors and the fate of Buffalo Gold and the Furtei mine. It is also not valid to compare, by implication, the very stringent environmental requirements in the U.S. with those in Italy. Besides the Furtei mine is apparently in no worse shape than that left by the original mining company. Crown King is a small village, a “living ghost town,” in the Bradshaw Mountains about 85 miles north of Phoenix, Arizona. It can be reached via a steep, narrow, winding dirt road wending its way up a mountain in Prescott National Forest. Crown King has been in the news recently because of the Gladiator forest fire raging near the village. The current population is about 130, but in its heyday, spanning the turn of the 20th Century, Crown King had about 800 buildings and a booming mining industry producing gold, copper, lead, zinc, and silver. It even had a railroad at one time. An interesting history of the village and mines can be found at http://www.crownking.com/history.html. “During the fall rainy season of 1897, an incident occurred that was to create one of the many lost treasure stories that endure in Arizona history. George Harrington, on the first leg of a visit to the east, was being driven in a buckboard to Prescott by experienced freighter J.P. Bruce. The buckboard also contained $5,000 in bullion from the Crown King Mine. They had crossed the rain-swollen Wolf Creek, about six miles from Mayer, and were climbing the far bank when one of the horses balked. The buckboard slipped back into the water and overturned. Harrington managed to save himself by grabbing a tree branch, but Bruce and the horses were caught in the flood. Unable to find Bruce, Harrington walked to Mayer and phoned to Prescott for help. A search party was sent out and Bruce’s body was found about a half mile below the crossing at 1am the next morning. The bullion was never found, even though it was searched for extensively after.” By the way, that $5,000 in bullion is worth about $420,000 at current prices. The following description of the mines is summarized from Arizona Lode Gold Mines and Gold Mining, by Eldred Wilson, 1934, revised, 1967, Arizona Bureau of Geology and Mineral Technology. Wilson gives dollar values for the ore and concentrates calculated at a gold price of $20.67 per ounce and a silver price of about $0.60 per ounce versus $1595 for gold and $28.00 for silver today. To get a rough estimate of the current value of the ore, multiply Wilson’s figures by 80. Wilson mentions “middlings” which are an intermediate product from a washer, concentration, or preparation plant consisting of fragments of mineral and waste rock. The material is often sent back for crushing and retreatment. The Crown King group of claims, southeast of Towers Mountain, includes the Crown King vein which has yielded the most of any deposit in the district. During the early days, this deposit yielded rich gold ore from near the surface. During the 1890-1901 period, the ore shoot was followed to a depth of 650 feet, with an estimated production of $1,500,000 of which $200,000 was paid in dividends. Transportation costs were greatly reduced by the extension, in 1899, of the Prescott & Eastern Railway into Mayer and further by the completion, in 1904, of the Bradshaw Railway from Mayer to Crown King. 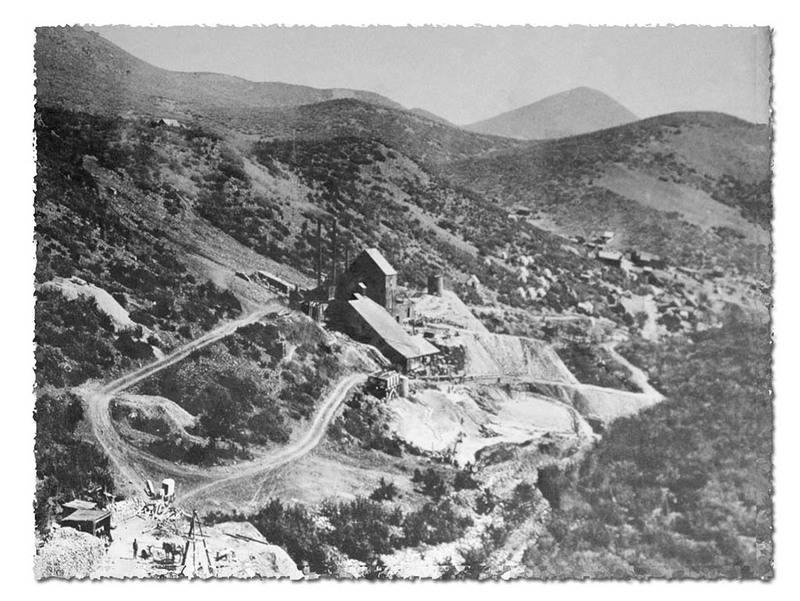 During 1906 and 1907, the Crown King Mines Company worked the middlings pile and shipped concentrates containing gold, silver, zinc, iron and copper. In 1909, the property was sold at receiver’s sale to the Yavapai Consolidated Gold-Silver-Copper Company controlled by the Murphy estate, for $75,000. In 1916, lessees organized the Bradshaw Reduction Company which installed flotation equipment and made a few tons of concentrates from old middlings. Some ore is reported to have been blocked out above the 480-foot level, but was not mined. That’s the way it was, once upon a time in Crown King. Crown King’s mining days have past. The village is now a tourist destination. In my role as an exploration geologist, I examined many properties submitted to my employer in the hope that they would be of interest for development. Some of those properties turned out to be scams, especially gold and platinum prospects. I remember one in particular. A small company claimed it had discovered gold in one of the basaltic cinder cones near Flagstaff, Arizona. I was assigned to go take a look. 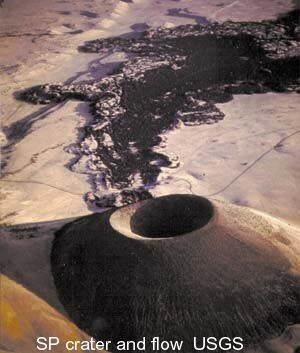 Cinder cones are relatively small, usually less than 1,000 feet tall, and form within months to years. They are built when gas-charged frothy blobs of basalt magma are erupted as an upward spray, or lava fountain. During flight, these lava blobs cool and fall back to the ground as dark volcanic rock containing cavities created by trapped gas bubbles. If small, these fragments of rock are called “cinders” and, if larger, “bombs.” As the fragments accumulate, they build a cone-shaped hill. Once sufficient gas pressure has been released from the supply of magma, lava oozes quietly out to form a lava flow. This lava typically squeezes out from the base of the cone and tends to flow away for a substantial distance because of its low viscosity. Cinder cones are probably one of the last places you would expect to find gold. When I arrived on the property, I spoke to the owner and asked him where he had found gold. I dutifully collected samples there and at other spots on the property. There was no visible sign of gold, but that’s not unusual. The first red flag appeared when the owner offered to have his on-site assayer analyze the samples for me. So, just to humor him, I split some of the samples and offered a portion for assay by the owner’s chemist. Not surprisingly, the chemist reported gold in all the samples. When I got back to Tucson, I again split the samples and gave a portion to our in-house assayer and sent the rest to an independent assayer. Again not surprisingly neither our chemist nor the independent assayer found any gold. Conclusion: the submitter’s chemist was either incompetent, or a crook. He could have just faked the numbers, but there are many ways to “salt” the sample. The most common are dropping a gold chloride solution on the sample before assay or adding a little gold dust to the sample. One of the most blatant ways of salting mine workings is the shotgun method. I once examined an adit that had blebs of gold on its walls, real gold. The pattern suggested that gold dust was put into a shotgun shell and fired at the walls. And that owner could not explain why the original miners did not notice and recover the gold along the adit walls themselves. 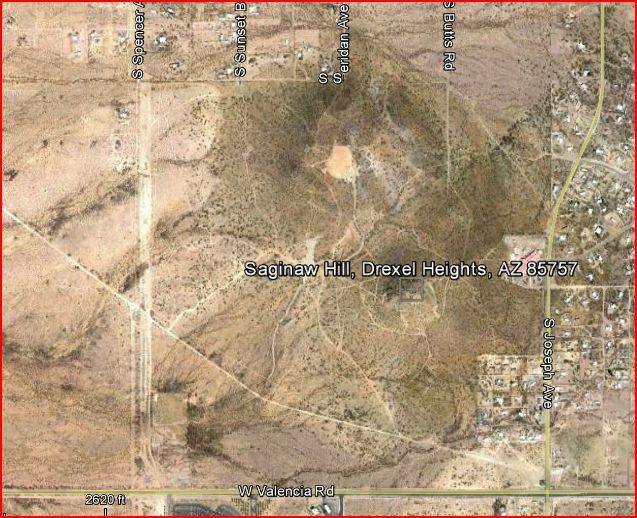 Saginaw Hill is located about 10 miles southwest of downtown Tucson. See general location on the map below. A former small surface and underground Cu-Zn-Pb-Ag-Au-Mo (copper, zinc, lead, silver, gold, molybdenum) mine located in the NE ¼ sec. 11 & NW sec. 12, T.15S., R.12E. 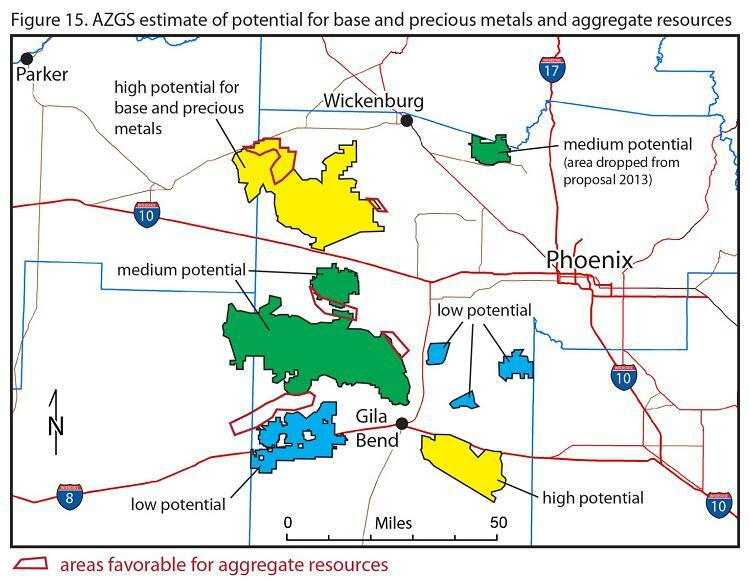 Owned at times, or in part, by the Saginaw Mining Co.; and the Tucson Arizona Copper Co.
Mineralization is sparse, spotty, partly oxidized base metal sulfides along fissure zones in limestone lenses in silicified Cretaceous Amole Arkose. Ore control was quartz veins as siliceous replacements along fractures. Alteration included limonite, quartz, sericite, clay, pyrite, and garnetization-epidotization. Associated rock units include the Saginaw Hill Porphyry, latite. Weakly mineralized. Chalcopyrite & pyrite on the W side of the Saginaw property, copper oxides on the E side of the property (Papago Queen). Cerussite & galena on the S end of the property along rhyolite-limestone contact. The identified ore zone is 330 meters long. Local structures include NE-trending fractures, brecciation. On the SE side of the fracture and extending 300 meters away is propylitized quartz monzonite. Local limonite and partly oxidized pyrite with minor copper silicates along the fracture zone. Workings include shafts, pits, and minor underground workings. Worked prior to 1900 with a possible 100 tons of low-grade ore produced. Production was sporadic. Production of smelter flux from 1956-1959. Has been prospected for porphyry copper. Prospect workings concentrated along N60E trend but no good fracture zone is exposed. Worked intermittently from 1918 through 1954. Total production amounted to some 2,300 tons of ore averaging about 13% Zn, 2.2% Pb, 0.7% Cu, 2.5 oz. Ag/T and 0.06 oz. Au/T. Mineralization is disseminated copper oxides and carbonates with minor molybdenum oxides in quartz veins and along fractures in a weakly altered, brecciated, and mineralized Laramide (?) porphyry stock. Workings include tunnel and open cut operations. Sporadic production of copper ore occurred from 1917 to 1934, and of smelter flux in 1956 through 1959. Total output was some 3,700 tons averaging about 1% Cu and 0.5 oz. Ag/T. This area had long been a favorite of mineral collectors. It is one of the few places in the world where peacock-blue cornetite is found. 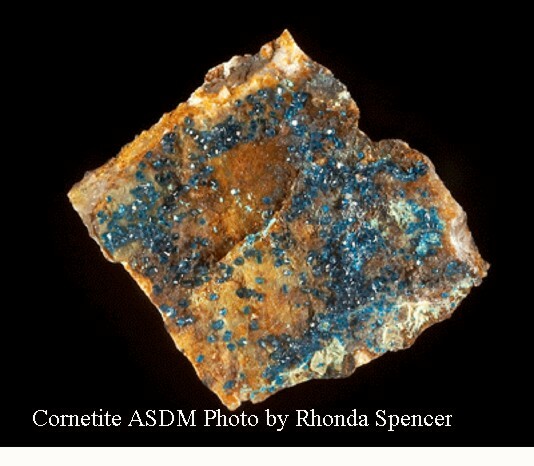 Cornetite is a copper phosphate with the formula Cu3(PO4)(OH)3. 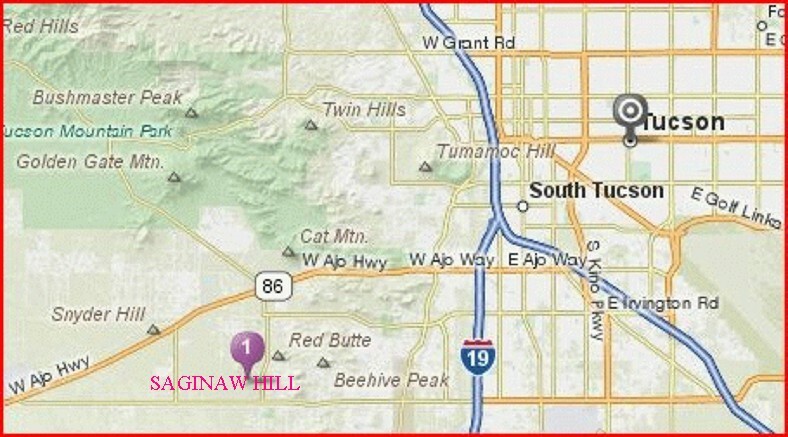 The Saginaw Hill mineralization is intimately related to the big copper mines west of Green Valley to the south. That will be the subject of a future post. Because subdivisions were encroaching on the area, Pima County investigated Saginaw Hill in about 1988 with the view of turning it into a park. At the time, the mines were abandoned, there were mineralized dumps on the property. An assessment of the property by Pima County officials found (surprisingly to them apparently) that the area contained concentrations of toxic heavy metals. The County made several more assessments and by 2003, the Bureau of Land Management (BLM) got involved. See the BLM report here, it provides many photographs. In 2005, the BLM was deciding what to do and there was much furor in the press. See examples from the Tucson Citizen here and here. The BLM filled in the many mine shafts which did pose a danger. They also collected surface mineralization and dumps and buried the material on site to mitigate the imagined danger of heavy metal contamination. The Google Earth photo below shows how the area looks now. The orangish patch is were the material is buried. Saginaw Hill is closed to mineral collectors. Sometimes mines just vanish. 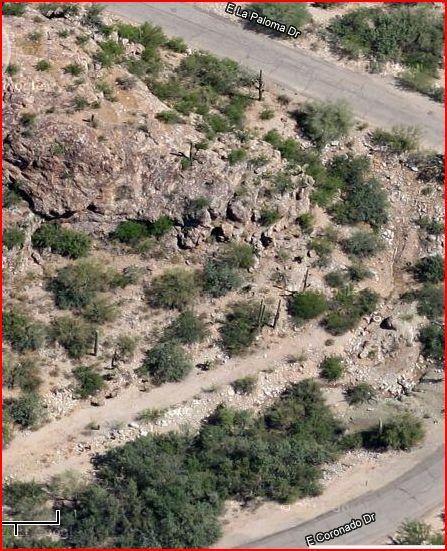 Such seems to be the case with the Pontatoc mine located near the north end of Pontatoc Road in Tucson and just south of Pontatoc Ridge. The map below shows the general location (at the balloon). The Pontatoc mine was discovered in 1906 and worked until 1917. It produced about 5,000 tons of copper, silver, gold, and molybdenum ore. Mindat.org reports that handpicked ore assayed at 4% copper, 0.5 oz./T silver, and a trace of gold. Mineralization occurred in a wide altered breccia zone along the Catalina foothill fault dividing Catalina Gneiss, a Laramide metamorphic, from Tertiary to Quaternary Pantano conglomerate beds. “Ore occurred in the fault zones wherever rock alteration is intense. Alteration included silicification, propylitization, spordic dolomitization and epidote. Sulfides precipitated with quartz,” according to Mindat.org. Workings consisted of two shafts, one 105 feet deep, the other 125 feet deep, plus a pit and tunnel operations. 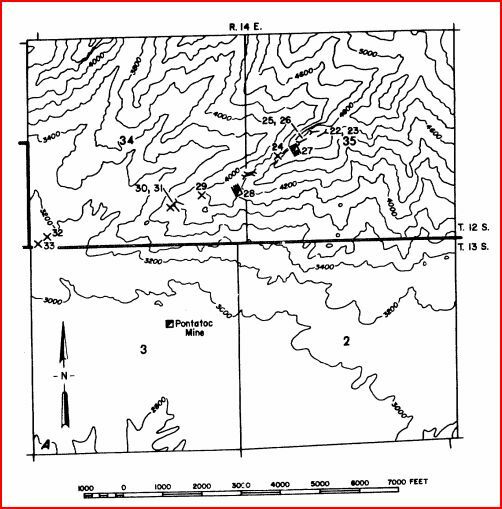 The following graphic from the Pusch Ridge wilderness study by George S. Ryan shows again the general location and location of mine workings on Pontatoc Ridge to the north. According to Ryan, Pontatoc Ridge was intensely prospected shortly after the production from the Pontatoc mine itself. There were several shows of oxide copper on the ridge, but apparently they didn’t amount to much. So far I’ve shown rather vague locations for the Pontatoc mine and it may surprise you where it was. The map below shows the mine location with current development. 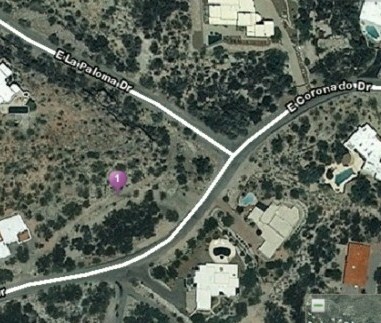 The following graphics show where I think the mine was, just west of the intersection of E. La Paloma Dr. and E Coronado Dr. There is no trace of the pit or shafts, presumably they have been filled in. The detailed picture does show what is presumably the scarp of the fault in which the mineralization developed. Some mines just disappear and houses are built along or near fault zones. This particular fault is apparently inactive, homeowners shouldn’t worry. By the way, Ryan reports that gypsum was mined from Tertiary lake beds in the same area and used for plaster in the Tucson building industry prior to 1966. Pima County, Arizona, U.S.B.M. open file report MLA 118-82. 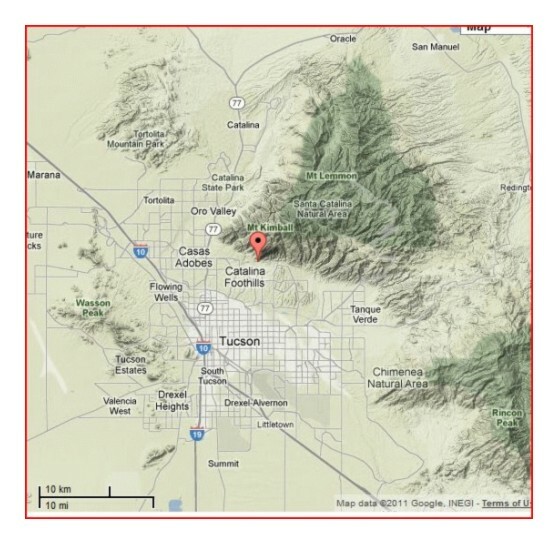 A few miles north of Tucson is a town called Oro Valley and a large dry wash running along the west side of the Santa Catalina Mountains called Cañada del Oro (oro = gold), see map below. The name derives from placer gold found in the alluvium along the wash. Placer gold is gold from somewhere else that has been transported from its source and mixed with alluvium. That “somewhere else” is in the Catalina mountains, somewhere. Below are two descriptions from the geologic literature. They report gold content in cents or dollars per cubic yard, so a note on gold prices is in order. In the U.S., from 1792 to 1834, the gold price was $19.75 per ounce. From 1834 to 1934 the price was $20.67 per ounce, then $35 per ounce until 1973 when the price was allowed to fluctuate with the market. One of the other sources referred to by Wilson might be mineralization of the Burney claims, located near the headwaters of Cañada del Oro, about four miles south of Oracle. 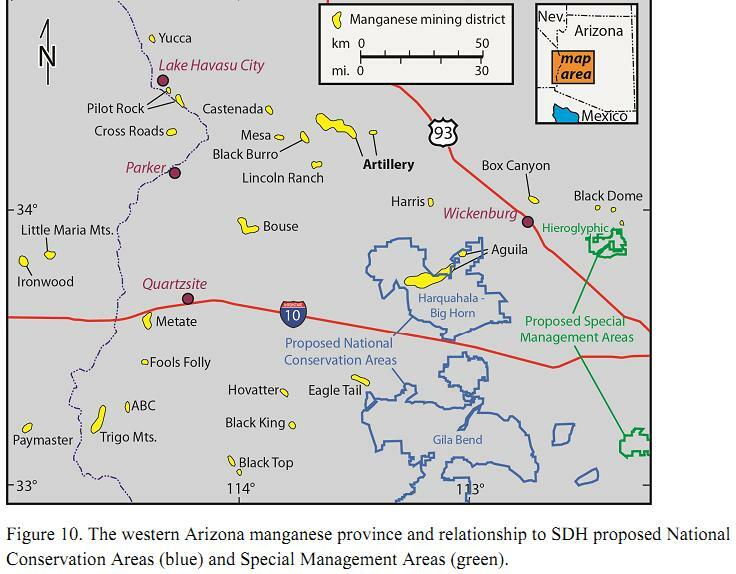 These prospects had production from 1947-1967 along veins containing complex sulfide and oxide ore containing lead, silver, copper, zinc, gold, manganese, molybdenum, and tungsten. The presence of gold has inspired some stories of lost cities and buried treasure. One, the story of the Mine With The Iron Door, was a novel written in 1923 by Harold Bell Wright. This story was made into a movie in 1924, filmed in Oracle, and has had several remakes including “MacKenna’s Gold.” One version of the story is that Jesuit priests were mining gold in the Santa Catalina Mountains but were forced to leave. They buried their gold in an old mine and secured it with an iron door. They never came back, and the mine with the iron door has never been found. More on the legend here. There apparently was at least one real “lost city.” Recently archaeologists found a 3,000 year old encampment at the confluence of the Cañada del Oro, Rillito Creek and Santa Cruz Rivers that, they say provides a “a glimpse into the transition from roaming bands of hunters and foragers to a society of skilled farmers.” “What most excited researchers working at the site was evidence that the people who once inhabited the area had created a system of canals. The early engineers found they could maximize their agricultural output by diverting the water flow from the Santa Cruz to adjacent fields.” See the rest of that story here.